Books, books and… well there are just two books available for pre-order.. The upcoming releases for two of my books are just around the corner, but you don’t have to wait to order them. You can pre-order the Kindle versions today… and tomorrow…. and so on and so forth. Hillbilly hitmen Step and Kenny don’t do God’s work. They close out deadbeat crackers without a second thought, because they aren’t paid to have second thoughts. Everything changes when a girl goes missing, and the killers suspect their employers are involved. 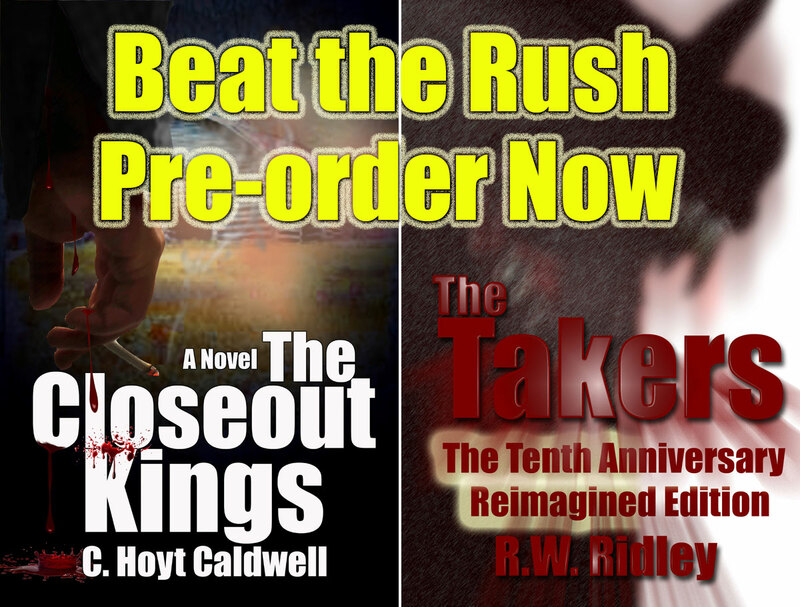 Desperate to find answers, the closeout kings broker a deal with a deputy hellbent on tying them to a double homicide. Together they uncover a ring of horror that has plagued their mountains for years. This is the tenth anniversary reimagined edition of the award winning story about a teenager discovering he is responsible for the end of the world. With a new ending and 40 additional pages, this is a new twist on the classic tale. When 16-year-old Osmond “Oz” Griffith wakes from an illness on the floor of his closet, he discovers the world overrun by man-eating monsters, the Takers, and it’s largely his fault. In an effort to make things right, he gathers a band of survivors (a baby, an aged mechanic and a talking gorilla, among others), and sets off down his version of the yellow brick road, leading to the Atlanta Zoo. Along the way, he learns that his destiny was written by Steve, a boy from his past. Afflicted with Down Syndrome, Steve created new worlds, replete with battles between good and evil, in the comic books that served as his sole refuge from the teasing of Oz and his friends. Steve’s untimely suicide leaves only the comic books as clues to vanquishing the Takers. A Note of Caution: This version does not fit into the Oz Chronicles series. This is, if you will, an alternate universe version of The Takers. BTW – I also just finished my stage play. Anyone out there with advice on what to do with it now, please let me know. I’m a theater newbie.